Auto-Ordnance brings another custom 1911 to market with the introduction of the new I Stand 1911. The I Stand 1911 was created to pay tribute to those that gave their lives in service of America. The I Stand 1911 is built on a GI pattern 1911 with a 5-inch barrel, chambered in .45 ACP. The pistol’s safety, sights, trigger and beavertail all follow the Gi pattern but Auto-Ordnance says unlike standard GI guns, its 1911 is designed to shoot with precision and accuracy. “Unlike GI guns, all Auto-Ordnance 1911s are precisely machined to modern standards. This guarantees that the GI 1911 may look like the original, but will shoot with a degree of accuracy far superior to the military guns,” Auto-Ordnance said in a news release. The I Stand 1911’s sear, slide and disconnector are all machined from solid bar stock which is then heat treated and topped with engravings commemorating American soldiers. The 1911 features the phrase “All gave some, some gave all” engraved on the dust cover, with “I stand” on the right side of the slide. 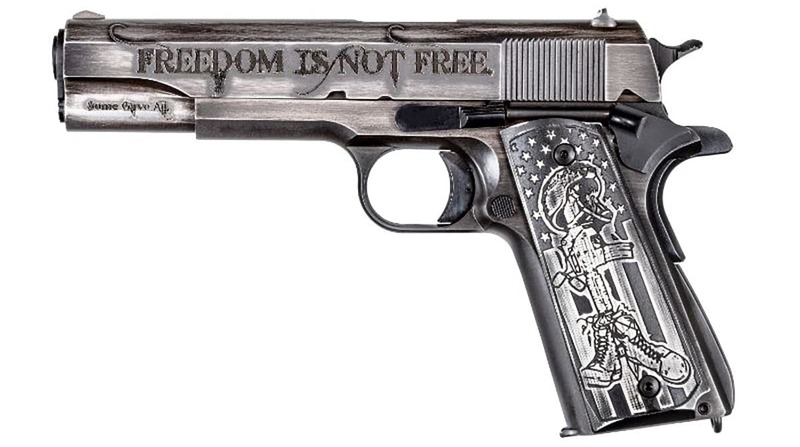 “Freedom is not free” is written on the left side of the slide while the American flag graces the right grip and a battlefield memorial is featured on the left grip. The pistol rounds out its design with a worn Cerakote in black and gray. The I Stand 1911 comes with a 7-round magazine and a price tag of $1,313. The post Auto-Ordnance launches I Stand 1911 appeared first on Guns.com.